There is no doubt that 40 and 100 GbE are just around the corner, or the reality is coming. To keep up with the pace, data center managers are striving to determine which fiber optic links will support 10 GbE today while future proofing the best, most effective migration path to 40 and 100 GbE. Many network designers recommend that the use of 12-fiber multimode trunk cables can provide the best migration path to 40 and 100 GbE. While others confirm that 24-fiber trunk cables with 24-fiber MPOs on both ends is a better standards-based transition path. So which one is the most suitable solution? It all comes down to a brief comparison of these two cables over investment and reduced future operating and capital expense. The use of 24-fiber trunk cables between switch panels and equipment is a common-sense approach, but people may not be familiar with this optic scenario. In fact, a 24-fiber trunk cable is used to connect from the back of the switch panel to the equipment distribution area. For 10 GbE applications, each of the 24 fibers can be used to transmit 10 Gbps, for a total of 12 links. For 40 GbE applications, which requires 8 fibers (4 transmitting and 4 receiving), a 24-fiber trunk cable provides a total of three 40 GbE links. For 100 GbE, which requires 20 fibers (10 transmitting and 10 receiving), a 24-fiber trunk cable provides a single 100 GbE link as shown in Figure 1. 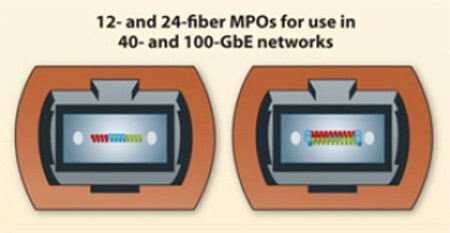 As noted before, 40 GbE uses eight fibers of a 12-fiber MPO connector, leaving four fibers unused. When using a 12-fiber trunk cable, three 40 GbE links using three separate 12-fiber trunk cables would result in a total of 12 unused fibers, or four fibers unused for each trunk. But with the use of 24-fiber trunk cables, data center managers actually get to use all the fiber and leverage their complete investment. Running three 40 GbE links over a single 24-fiber trunk cable uses all 24 fibers of the trunk cable. Obviously, 24-fiber is more appropriate for 40/100G migration. Because 24-fiber MPO connectors offer a small footprint, they can ultimately provide increased density in fiber panels at the switch location. With today’s large core switches occupying upwards of 1/3 of an entire rack, density in fiber switch panels is critical. Hydra cables feature a single 24-fiber MPO connector on one end and either 12 duplex LC connectors on the other end for 10 GbE applications, 12-fiber MPO connectors for 40 GbE or a 24-fiber MPO connector for 100 GbE. With a single 1RU fiber panel able to provide a total of 32 MPO adaptors, the density for 10 GbE applications is 384 ports in a 1RU (duplex LC connectors) and 96 40 GbE ports in a 1 RU (12-fiber MPOs). Figure 2 shows a 12-fiber MTP trunk cable with MTP/APC connector on both ends largely improves the performance for 40G/100G fiber links. Cable congestion is one of the biggest problems in the data center because it will make cable management more difficult and impede proper airflow needed to maintain efficient cooling and subsequent energy efficiency. In fact, a 24-fiber trunk cable are only appreciably larger than 12-fiber trunk cables in diameter. That means the 24-fiber trunk cables provide twice the amount of fiber in less than 21% more space. For a 40 GbE application, it takes three 12-fiber trunk cables to provide the same number of links as a single 24-fiber trunk cable—or about 1-1/2 times more pathway space. As 24-fiber trunk cables can effectively support all three applications shown in Figure 3, there is no need to recable the pathways from the back of the switch panel to the equipment distribution area. That means that data center managers can easily migrate to higher speeds with all of that cabling remains permanent and untouched. With 24-fiber trunk cables offer guaranteed performance for 10, 40 and 100 GbE, upgrading the cabling infrastructure is as simple as upgrading the hydra cables or cassettes and patch cords to the equipment. With guaranteed support for all three applications, the ability to use all the fiber deployed, reduced cable congestion and higher port density in fiber panels, and an easy migration scheme, 24-fiber trunk cables offers lower future capital and operating expense. 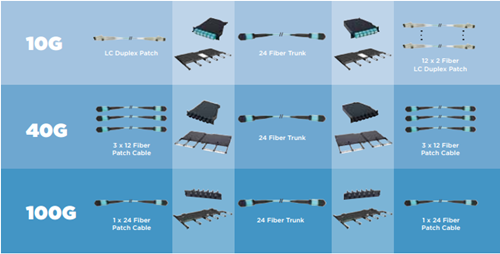 Fiberstore supplies 12, 24, 48, 72, 96 and 144 fiber core constructions with OM1, OM2, OM3 or OM4 fiber trunk cable, these trunk cable assemblies are composed of high quality LSZH jacketed fiber optic cables, connecting equipment in racks to MTP/MPO backbone cables. 40G QSFP+ optical transceivers like FTL410QE2C and QSFP-40G-LR4-S are also provided. If you are interested in any of our products, please contact us directly. This entry was posted in Fiber Optic Assemblies and tagged 100 GbE, 12-fiber, 24-fiber, 24-fiber trunk cable, 40 GbE, 40/100G Migration, FTL410QE2C, MPO connector, QSFP-40G-LR4-S on March 25, 2016 by Angelina.Li.